Starting things off, our performance consistency test explores the extent to which a drive can reliably sustain performance during a long-duration random write test. Specifications for consumer drives typically list peak performance numbers only attainable in ideal conditions. The performance in a worst-case scenario can be drastically different as over the course of a long test drives can run out of spare area, have to start performing garbage collection, and sometimes even reach power or thermal limits. 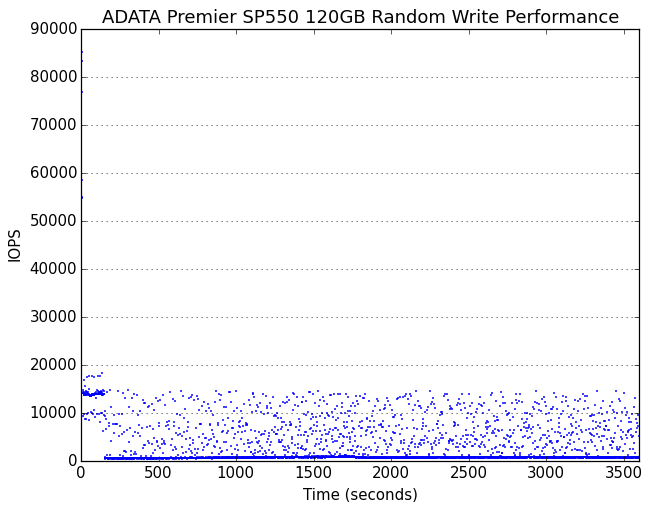 For its capacity, the SP550 maintains a higher average random write speed than most low-end drives and even manages to beat some MLC drives, including a narrow advantage over the SM2246EN-based Crucial BX100. This is significant as the only major change between the SM2246EN and the SM2256 was the addition of LDPC error correction, so the firmware on the SP550 is achieving better performance with slower flash on a controller that is basically the same where this benchmark is concerned. The SM2256 is a budget-oriented controller based around a single-core processor. This makes it extremely difficult to completely eliminate pauses or periods of greatly reduced performance during garbage collection. The SP550 is hardly alone in this, and its consistency scores are typical for its market segment. 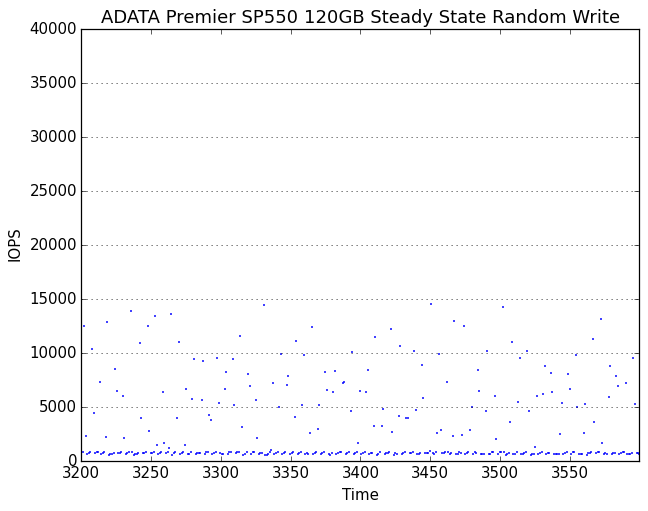 Upon reaching steady state, the SP550 shows a clear baseline of performance plus some random variation that is capped at the average IOPS attained before the spare area was exhausted. At the higher capacities a much higher share of the writes are completed at full speed and the distribution becomes mostly bimodal. Looking more closely at the steady state, we can see that the garbage collection cycles take longer on the higher capacity drives, though not as long as on the Toshiba Q300. Neither the baseline performance nor the peak performance is strongly dependent on capacity. I never really thought about core counts in storage controllers before this review. What would your average mid range and high end SSDs have for controller CPUs? 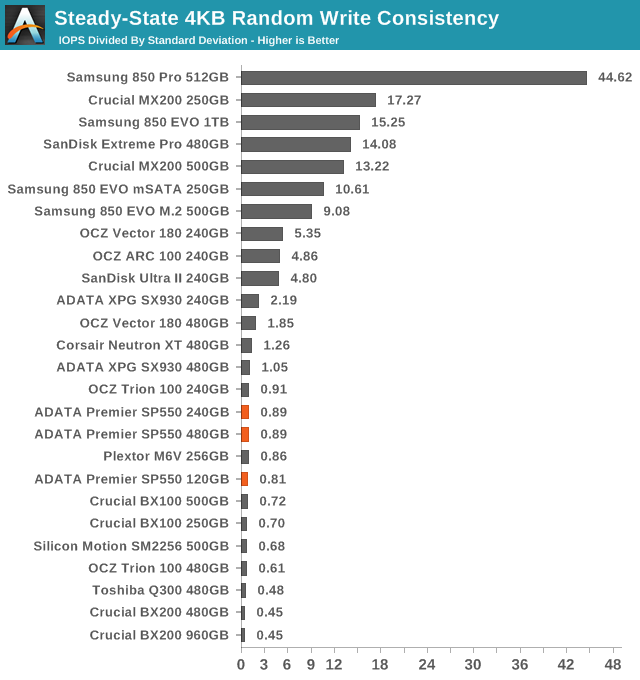 The 2TB 850Pro/EVO article here on Anandtech has a table showing core counts and clock speeds of the recent Samsung SSD controllers: MDX, MEX, MGX, MHX, all of which are 3-core ARM Cortex R4 except for the MGX which is a dual core ARM Cortex R4. The breakdown is a bit complex but it looks like MDX is 840/840 Pro. MEX is 840 EVO, 128-1TB 850 Pro, and 1TB 850 EVO. MGX is 120-500GB 850 EVO, and MHX is in the 2TB 850 Pro/EVO. Going through historical articles (840 Pro review) I found that the Samsung 830's controller was called the MCX and it is implied but not directly stated that it was a 3-core ARM9 design. Not to toot my own horn, but the "Update" in the 840 Pro article regarding MDX being R4 rather than ARM9 was at least partially due to an email chain I had with Anand. Yes, I emailed him instead of blasting him in the comments section. As I recall, he said the original press kit had said ARM9. I'd seen Cortex-R4 elsewhere on the 'net, and Anand reached out to Samsung for confirmation. I assume he got it because he updated the article later that day. I don't remember seeing much info on core counts for other controllers, but the 840 Pro article also has a table where it notes DRAM Size for various controllers of the time. What's notable to me is that the old Intel controllers like in the X25M G2 didn't cache user data, only the mapping tables, so the G3 is listed in the table as using up to 64MB cache. 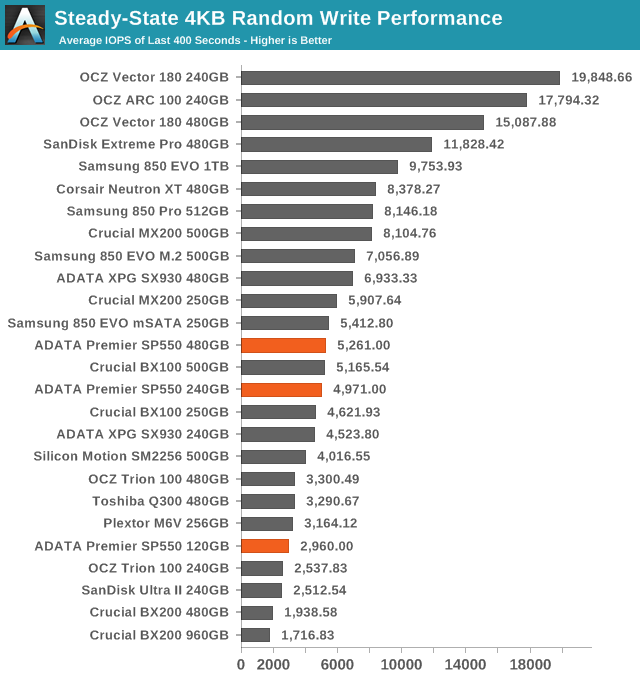 In general, they perform fine for light & general user scenarios, but IOPS suffers. In SM2246XT product brief, random reads are quoted at 28,000 IOPS & random Write at 65,000 IOPS (120GB SSD with Toshiba 19nm MLC). Both Sandforce & SM2246XT are only used with MLC NAND since they were not design to work with TLC ones. Hi Billy, are there any plans to review the Sandisk Plus 240gb or/& 480gb? It's probably cheapest MLC drive in lower capacities now I believe. While it's similar to the Sandisk extreme 500, it will be interesting to see the differences of the same SM2246XT controller on a SATA3 interface instead of USB 3.0/3.1.